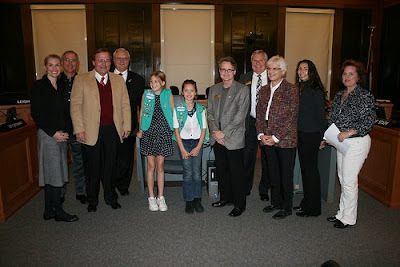 The Girl Scouts of Colorado Blog reports that to earn their Girl Scout Bronze Award, 5th grade Junior Troop 1947 of Steele Elementary in Colorado Springs, aimed to get a crosswalk at a dangerous intersection near their school. Neighbors had tried for years and suggested maybe the city would listen to Girl Scouts. Their advisors told them to take it to the citizen’s forum at City Hall, but first meet one-on-one with a couple key City Council members. To create buzz and generate support on the day of the presentation the troop placed signs at the dangerous intersection, invited neighbors to attend and contacted the local media. The media story ran in local news outlets and eventually landed on MSNBC. The troop was able to get support from the City Council in these ways. The Council not only gave the Girl Scouts a “yes,” but praised them for their well prepared and thorough presentation, and, most importantly, for not taking “no” for an answer.